At the end of the end of the First World War Imperial Oil began to follow-up on reports of visible oil in the Mackenzie valley downstream from Fort Norman (now Tulita) (map). They sent a drill rig into the area in 1920 and discovered what they considered to be a substantial field of oil at a site today we call Norman Wells. The company tried to keep their discovery secret but word leaked out and during the winter of 1920-21 hundreds of men prepared to head north, after spring break up, to stake claims around the Imperial Oil well. Imperial Oil’s response was to purchase two brand-new airplanes, Junkers named Rene (G-CADQ) and Vic (G-CADP). These airplanes would carry a survey crew north to stake additional claims near the well. In the spring of 1921 they flew from Edmonton to Peace River then on to Fort Vermilion, Hay River and Fort Providence. It was when they tried to land at Fort Simpson (see map) that disaster struck. 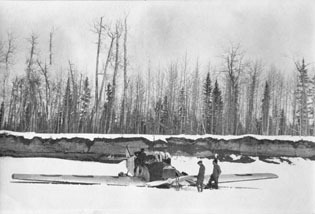 Rene, landing in the soft snow of a field near the Fort Simpson trading post, tipped onto its nose breaking its wooden propeller and one of its skis. Vic landed without difficulty even though it had developed a serious knock in its engine. Mechanics for the Rene and Vic – these early planes always flew with a mechanic on board – quickly removed the propeller and the ski from the Vic and put them on the Rene so that it could continue on its way down the Mackenzie valley. When the Rene tried to take off the engine stalled and the airplane nosed into the ground and broke its propeller. It looked as if these airplanes would be stuck in Fort Simpson until parts could be brought in on the first paddle-wheeler in July. Out of desperation, the pilots turned to the Hudson’s Bay Company for help. The two trading post carpenters, Bill Hill and Walter Johnson, built an exact replica of the old propeller using oak toboggan boards and glue made by boiling moose hides and hooves. This moose-glue propeller performed perfectly and Imperial Oil was able to eventually stake the entire Norman Wells oil field. This first aviation venture into the north was a milestone in the history of the NWT. Airplanes opened up the North, making travel and transport easier, faster and safer.